These types of advertisements are the cheapest mode of advertisements. These are priced on per line / per word basis. The basic classified advertisement has the first word in capitals / bold with all remaining lines / words in regular style in simple paragraph. These type of advertisements are little costlier than the regular classifieds. These are priced on per column centimeter / per square centimeter basis. The format uses a border in a variable point size for higher visibility and greater impact. This style also allows the use of a logo or a visual. Classified Display advertisements are acceptable only in single column i.e. the width of Classified Display advertisements can vary from 3 centimeter to 4 centimeter as per the publication guidelines, not more than that. These types of advertisements are the HIGH IMPACT and the costliest type of advertisements. These advertisements can be of any size in width / height but should not be less than 3 centimeter. It can be color / black & white. Newspaper advertisements still have the power to reach out to a larger and diverse range of audience than any other means of promotion. This is mainly because newspapers attract readers of all ages and social status. From affluent to middle-income class and even the lower income class all read newspapers and therefore newspapers have a wider reach. If you are planning to promote your business or if you want to display some advertisement classified advertisement in newspaper is the best medium. Classified text ads are certainly the most popular of all because there are various benefits that come with it. A classified advertisement in a newspaper is priced based on words, lines and characters. Factors like background colours, screen border and ticks also can influence the overall rate of the classified ads. Classified text ads are ideal for all types of advertising especially matrimonial ads. Classified Display ads are priced on per square centimetre and are a bit costlier than the regular classified ads. These ads offer higher visibility and response rate because advertisers can use their brand logos and have a border to their ads to make it visually appealing. These ads usually have size restrictions and are ideal for obituary ads and recruitment ads. Display ads garner a lot of attention which is why they are costlier than classified ads and classified display ads. These ads do not have size restrictions and can occupy full page as well. These ads are ideal for branding, promoting business, recruitment campaigns, real estate projects, promoting retail chains and education ads. Personal Ads: Personal classified advertisements are quite common because these are personal messages that individuals want to convey through newspapers. These messages could be related to birthday greetings, season’s greetings, personal achievements, anniversaries, personal and professional announcements and even simple messages for friends, relatives and family members. 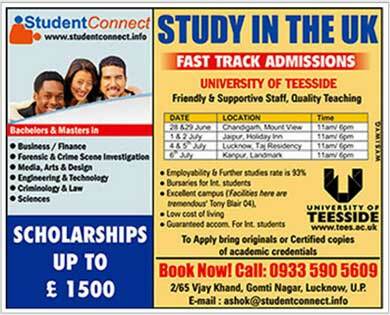 Education Ads: While the majority of the education ads are admission notices, but there are many types of education advertisements that appear in the newspapers. If you are opening up new coaching classes or if you are a private tutor you can place your ads in the education category. Many coaching centres that have limited budget prefer to opt for the classified format. Public Notice and Tenders: Public announcements usually gets printed in the public notice and tenders category where the public at large is notified about certain amendments and modifications brought through various new rules and regulations, laws and contract requirements. Such ads generally have plenty of information and therefore it is reasonable to publish them under classified format. Matrimonial Ads: All prospective grooms and bride advertise in a newspaper in the matrimonial category. The ad can be a text ad or an image of the prospective bride or groom. In most cases, parents and relatives publish matrimonial ads to reach out to a larger community. Recruitment Ads: Recruitment advertisements in newspapers can help employers to get employees to fill up vacancies in their offices. Most small and medium size businesses prefer to post their ads in the Situation Vacant advertisements providing information about the job profile. While job seekers usually post their ads in Situation Wanted category mentioning their skills and qualifications. Obituary Ads: Typically, obituary ads include images of the deceased along with the message chosen by the advertiser. These messages are usually related to remembrances, funeral invitations and events and condolence messages. Property Ads: Property ads are usually about sale and purchase of individual apartments, flats and homes. Individual property owners, brokers and landlords usually place these ads in the newspapers. Business Ads: Business classified advertisement in the newspaper are usually about various business proposals, sales promotions, business offers and when businesses are seeking partners for their future ventures.